B U B B L E G A R M: Eating Clean! I have been eating 'clean' for the past 9 days and wanted to do a little update on here for you. I started a food diary with Instagram and named myself the 'officialfooddiary' and promised myself to photograph EVERYTHING I EAT. 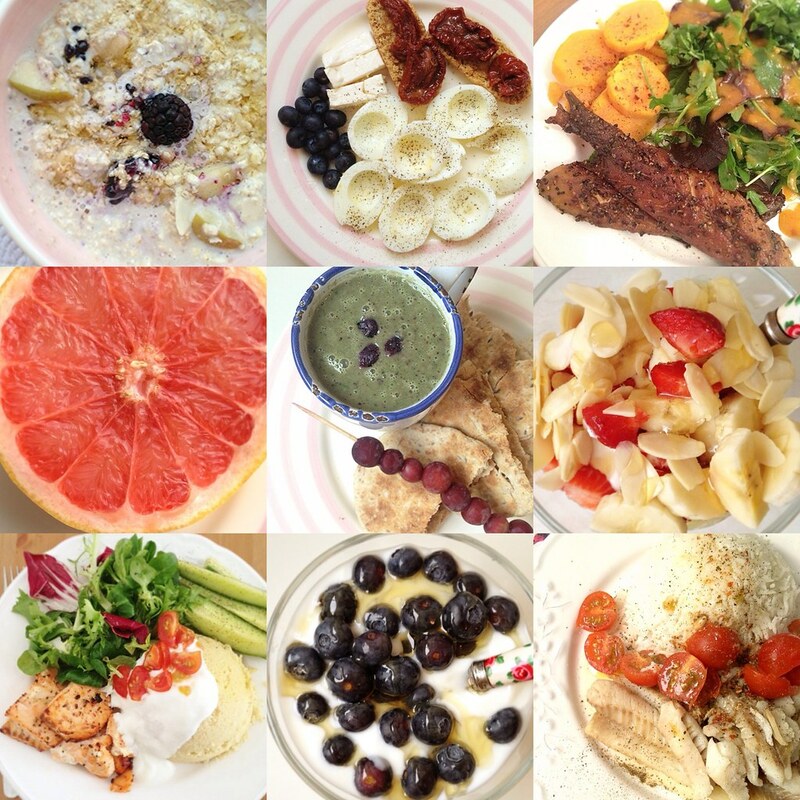 I challenge everyone who wants to make better healthier choices with food to also start a photographic food diary. It has kept me on track and kept me motivated. I have sometimes wanted to take a few scoops from the peanut butter jar but changed my mind due to 'oh I can't be bothered to photograph that now'. It's silly but it works. Obviously, I'm staying true to myself and I'm doing this for myself. I follow fellow instagrammers who also sometimes update their meals and snacks and it's great to share ideas, inspire and be inspired. View my 'official food diary' updated in real time HERE. I'm trying to lower my carbs to 70-100g per day, and not eating carbs for dinner. I have increased my protein intake to help repair muscle and essentially for my body to burn fat for fuel instead of energy from carbs. Read up on ketosis and do your own research for detailed info. I am not inviting negative comments, I'm going to be doing high carb days too. I'm not counting calories but assume I'm doing just under the recommended amount. I check the fat, sat fat and carb content of EVERYTHING. A few months ago I calorie counted and lost 8lbs in 8days, but I was HUNGRY and the weight just crept back on. For me, calorie counting is really obsessive but it does work if you keep it up. I'm not for yoyo dieting or funky diets. Lower your carbs and eat healthy nutritious food and lose weight the slower way and then you will keep the weight off and you will have had a lifestyle change. After 9 days I feel amazing, I feel so much better within myself and I know that it's going to get better. However, the first 3 days my body was in shock and I was extremely tired. I then experienced bloating, which is really weird and think if anything the opposite should happen, but healthy food contains a lot of fibre and protein causes a lot of gas! *Boo* but I have read that fennel tea and just water with lemon juice helps which I will be trying soon. I didn't weigh myself at the beginning purely because my scales battery was out, but in a way I'm glad because sometimes when you see that you have lots only 1 pound for example it can be disheartening and keep you off track. I did take measurements and photos. I will weigh myself tomorrow morning, right it down and not jump on the scales for another week. Eating healthy combined with exercise - cardio and weight training will get me the body I need but hitting the gym is proving difficult with a 1 year old, I sometimes try to workout at home but it doesn't go down to well. I'm not in a rush to lose weight, but would like to be more toned and live a healthier lifestyle and am so proud that I have been eating clean. I love what I have been eating, I'm not hungry and the food is yummy! I enjoy cooking and coming up with different sauces and side dishes, I can't eat the same thing everyday so always change it up! Here's to a healthier lifestyle! For more fitspo follow my Pinterest board HERE. Good for you love! There's nothing better than feeling great about yourself ESP after having a baby! Eating clean can be a bit of work in the beginning but is great once you get into the swing of it! @Andee - deffo, it's so satisfying! Good for you for making positive changes and losing the weight the right way! Once you make it a lifestyle and not a "diet", the weight will stay off for good! Way to go! Loving this and instagram is a great way to keep track. Fabulous dishes you have up there! Wow...those meals look so yummy, I've actually been thinking about your instagram feed the past few days and thinking of trying out something similar. You've definitely inspired me. Just a question about the boiled eggs...what do you do with the yolks? I think you look fab anyway Muhsine! I am doing the 5:2 diet at the moment, seems to be going well! Loving this post! Your food looks so tasty, I definitely need to try eating like you! What a great Idea to be accountable for everything you eat. What a great idea! Everything you've posted looks so yummy! A photo of a chinese take out never looks that good - and there's reasons why! Definitely tempted to start the same idea myself! Thanks for sharing! I have been doing the same for the past year or so, but slowly changing my diet so now it's a normal thing to skip carbs for a meal as I'v replaced it with so many vegetables and protein. It's always nice to see other peoples food though for some more food inspiration! Isn't clean eating the most amazing thing? I have been doing it for over a month, and it feels wonderful. Plus, foods are not bad either. Keep up the fantastic work! Your pics turn out great, and it's fantastic motivation for us all! Keep up the great work! I follow your IG DAILY! Great job and you look wonderful. I was wondering if you can do blog posts about how to get started or what are some of the tips to keep up with it. I am at university all day everyday and my eating habits are a WRECK! I would love some tips and to start eating clean. I Just wanted to see that i adore you and find u cok guzel (l) i learn so much from u about make up & stuff and enjoy reading your articles! Also.. your angel esra is Masallah a dream!! Im Also a young mum (23) and i have a baby gjrl that is now 4 months, its amazing how fast they grow!! I hope all Allah will give u happyniss and love in life ! Wow, I'm impressed! Good for you! Your doing so great!! You have inspired me to eat healthier! That looks SUPER healthy. Makes me hungry looking at it all! I love this post, i wish i could eat the things you come up with but my variety in food i like is low. Ive just started the 30 day shred so am calorie counting and doing a 20 workout everyday, plus zumba or a walk but like you say it becomes obsessive and left hugry like i am now, i havent even been able to eat dinner as my calories are gone! I have a sweet tooth too much to cut it out i think it would drive me crazy, but have changed my fizzy drinks for water and juice which is alot better. Im so stuck on what to do now. I have started a healthy living by choosing what I eat. I am currently on a veggies and fruits diet now and its great so far. It's great for us mommies..